A major snowstorm dumped more than a foot of snow in cities across the north-east US early Friday morning, causing thousands of flight cancellations, school closures and paralyzing road travel. Though weather in Orlando stays calm, this causes serious problems for people traveling to and from Midwest and northeast parts of the country. Flights to other parts of the country also were delayed as the effects of the storm rippled through the nation’s airline system. 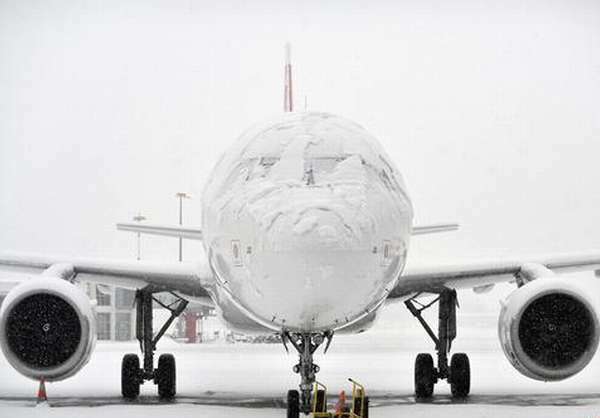 On Thursday U.S. airlines canceled more than 2,300 flights due to snowfall and low visibility. There are currently no flights in or out of John F Kennedy International Airport, according to the airport’s website. Fliers are recommended to check with their individual airlines for an update on flight status. The terminals remain open. La Guardia and Newark airports are experiencing heavy delays. As of Friday morning, nearly 40 flights to and from Orlando were reported canceled or delayed, according to a flight tracking service on the airport’s website. Many of the canceled flights were heading to northeastern cities affected by the storm, such as Boston, New York, Washington D.C., Newark, N.J. and Hartford, Conn. Flights to other parts of the country also were delayed as the effects of the storm rippled through the nation’s airline system. Airport spokeswoman Carolyn Fennell said Thursday that more than 200 flights had been affected. The longest delay at that point was six hours, on a flight to Hartford, Conn. At Tampa International Airport, traffic on what is traditionally one of the busiest days of the entire year was severely disrupted. “We have had 23 flight cancellations, 19 departures and four arrivals,” spokeswoman Christine Osborn said. Allegiant Air has been forced to reschedule several flights going in and out of Tampa/St. Petersburg and Orlando/Sanford because of the weather, said spokeswoman Jessica Wheeler. The storm comes at the end of the busy holiday travel period, when many planes are running nearly full, making rebooking passengers whose flights have been canceled more difficult.